In which our hero learns a hard lesson, which is that you should always assume that your enemies have ALSO been reading Sun Tzu. This picture book takes a fun look at sibling rivalry through the eyes of a naughty little boy with a wild imagination. The little guy in this story likes to think that he's a bad guy, a great villain. He spends his play time trapping super heroes in a cage, stealing treasure and burying it, and plotting his younger sister's demise. The vibrant illustrations that come from someone with a background in movie animation make the narrative even more entertaining, especially when you get to the twists at the end. One of the twists is very subtle, and I found myself going back over it several times and even had my husband go over it! This one would be a terrific way to work on inferencing skills with young readers! I loved the idea of this book from the first moment I saw the cover, and it did not disappoint! It takes us into the imaginative play world of a self-identified "bad guy" -- we all know kids who love to act the part of the villain from their favorite movies and books! And for my kid, who always wants to be the hero, it was a great way to increase his understanding of the kids who do enjoy being the bad guy during play. I don't want to spoil the ending, but it's great...love the illustrations, too! This is an epic picture book. BAD GUY is a fabulous, wicked read aloud. I can't say enough about books that paint childhood with a realistic, yet fantastical paintbrush. Look for themes of bad behavior and sibling rivalry. The narrative voice and the illustrations are a perfect match. BAD GUY has a surprise twist that you may or not see coming, but the grand adventure is going back for a reread and finding all the clues to that twist and other sub-narratives. I've read it a bunch of times with my kids - I don't see how you can read it just once, you will be missing SO much. This story was a fun take on a brother who is the bad guy and why and what happens at the end that is a twist. It is fun with events from a child's perspective of things and adults not involved. My children loved the inside cover pages and pointed out the two icons for each child in the story. Interesting what reading aloud to children and what they found after each of 5 readings in two days. They loved the details the illustrator made. This Pixar-esque picture book does a wonderful job exploring what it means to be "bad": it means trapping all the superheros in a laundry-basket-like cage, it means eating your sister's spaghetti brain, and it means going to the library and checking out books titled KNOT GOOD. It also means subverting expectations in wonderful, unexpected ways. This bad buy shows us his bad behavior on each day of the week.Clever ending even took me by surprise! I look forward to reading this aloud to my students.Full color illustrations fill the pages with details. Don't miss the cover under the dust jacket!Great book to show supporting details. "I am a bad guy." Then each page shows another reason why. I love a book where the pictures and words have equal weight in telling the story! In BAD GUY, a young boy describes all the ways in which he's the "bad guy," but Yamada's illustrations hint that someone else is hatching a sinister plot. My kids loved this and got quite a chuckle from the ending...as did I! Would be fun to read aloud. Kids will enjoy seeing the shenanigans of the "bad guy" brother. I very much appreciated the (view spoiler)[girl power/don't underestimate us/gender role reversal message at the end (hide spoiler)]. Good tie-ins with superhero/villain tropes. Bad guys are sneaky, greedy, and well, bad. But they're also resourceful, ambitious (being bad is hard work! ), and it turns out, respectful when they meet their match. This book is full of silly fun, with perfectly matched, action-filled illustrations. I love this whole concept of a little bad guy in the making, and that a bad guy can come in unlikely forms. Also, you have got to take off the jacket to look at the cover illustrations underneath! So funny! Love the humor in this story! As you read this book with your little ones, be sure that they are looking at the illustrations so that they are in on the joke! Can't wait to use this one with a story time. Fun story about a mischievous and imaginative child. Great surprise ending and best end papers ever! I know everyone loves this book but I didn't like it. For me it encouraged sibling rivalry and to be mean to your sibling. My kids loved this one! So much to talk about and look at in the pictures. And gotta love the ending! A clever picture book about imaginative play, mischief, and sibling rivalry. Mike Yamada's action-packed illustrations add many fun details to the story. It had me hooked from the first page because as we all know every villain needs a white, fluffy cat. Fun patterns that switch, and a gender surprise at the end! Lots of little kids will love this story about being a "bad guy". I adored the twist ending! The ending has a very good twist. Love this laugh-out-loud sibling story! If your kid likes to be sneaky, they will love this book. This book is amazingly delightful. Score one for female empowerment as well. A fun read with big plans to be BAD! My favorite is the second to last page with the little sister's orange popsicle stained winning smile. A great story to read over and over again. Hm.. I'm not sure how I feel about this book. There are no consequences for the bad guy (or girl). Hannah Barnaby Mike Yamada - Hannah Barnaby is a former children's book editor and indie bookseller, and was the first-ever Children's Writer-in-Residence at the Boston Public Library. Her debut young adult novel, Wonder Show, was a William C. Morris Award finalist, and her second novel, Some of the Parts, received a starred review from Publisher's Weekly. 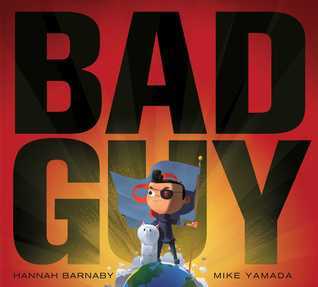 Hannah makes her double picture book debut in 2017 with Bad Guy, illustrated by Mike Yamada, and Garcia and Colette Go Exploring, illustrated by Andrew Joyner. Hannah lives in Charlottesville, VA with her family.